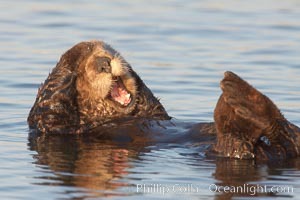 Sea otters mating. The male holds the female's head or nose with his jaws during copulation. Visible scars are often present on females from this behavior. 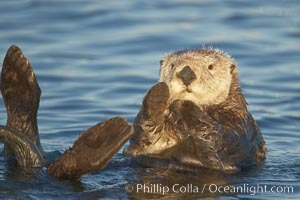 Sea otters have a polygynous mating system. Many males actively defend territories and will mate with females that inhabit their territory or seek out females in estrus if no territory is established. Males and females typically bond for the duration of estrus, or about 3 days. Elkhorn Slough Photo. 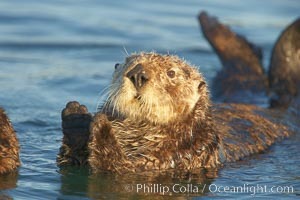 A sea otter, resting on its back, holding its paw out of the water for warmth. 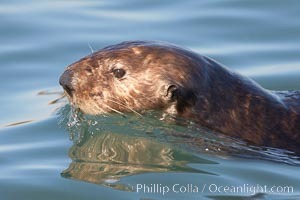 While the sea otter has extremely dense fur on its body, the fur is less dense on its head, arms and paws so it will hold these out of the cold water to conserve body heat. Elkhorn Slough Picture. 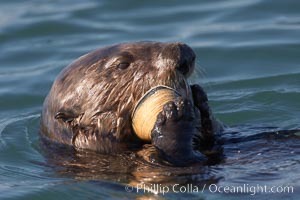 A sea otter eats a clam that it has taken from the shallow sandy bottom of Elkhorn Slough. 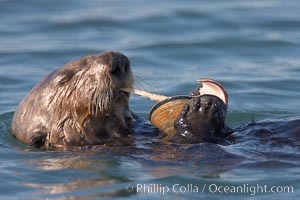 Because sea otters have such a high metabolic rate, they eat up to 30% of their body weight each day in the form of clams, mussels, urchins, crabs and abalone. 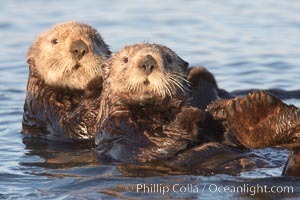 Sea otters are the only known tool-using marine mammal, using a stone or old shell to open the shells of their prey as they float on their backs. 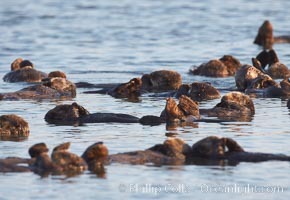 Stock Photography of Elkhorn Slough. 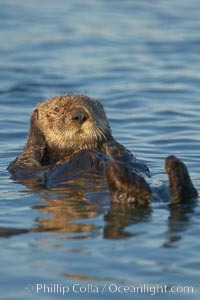 A sea otter resting, holding its paws out of the water to keep them warm and conserve body heat as it floats in cold ocean water. Photograph of Elkhorn Slough. 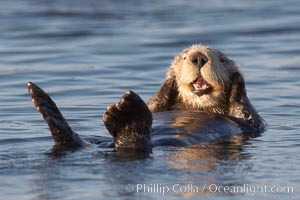 A sea otter resting, holding its paws out of the water to keep them warm and conserve body heat as it floats in cold ocean water. Elkhorn Slough Photos. 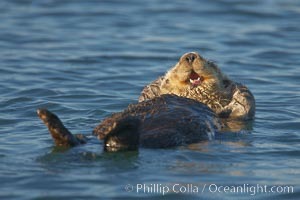 Sea otters, resting on the surface by lying on their backs, in a group known as a raft. Elkhorn Slough Image. 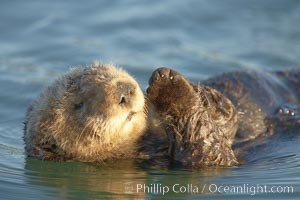 A sea otter, resting on its back, grooms the fur on its head. 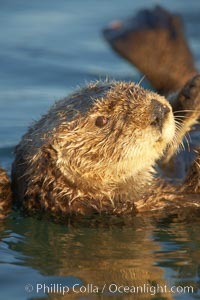 A sea otter depends on its fur to keep it warm and afloat, and must groom its fur frequently. Professional stock photos of Elkhorn Slough. 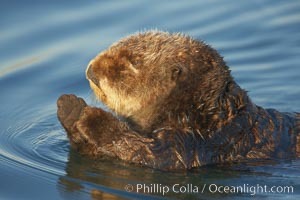 A sea otter, resting on its back, holding its paw out of the water for warmth. While the sea otter has extremely dense fur on its body, the fur is less dense on its head, arms and paws so it will hold these out of the cold water to conserve body heat. Pictures of Elkhorn Slough. 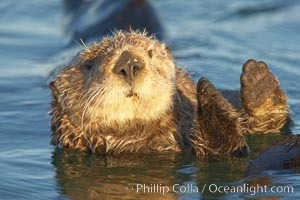 A sea otter, resting on its back, holding its paw out of the water for warmth. While the sea otter has extremely dense fur on its body, the fur is less dense on its head, arms and paws so it will hold these out of the cold water to conserve body heat. Elkhorn Slough Photo. 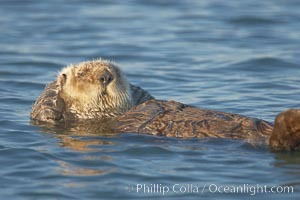 A sea otter, resting and floating on its back, in Elkhorn Slough. 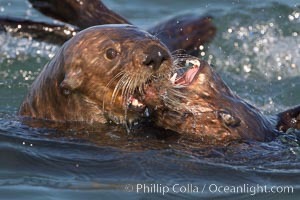 Stock Photography of Elkhorn Slough. 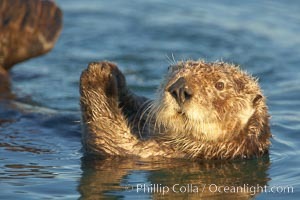 A sea otter, resting on its back, holding its paw out of the water for warmth. 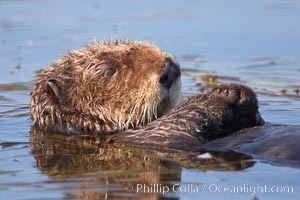 While the sea otter has extremely dense fur on its body, the fur is less dense on its head, arms and paws so it will hold these out of the cold water to conserve body heat. Elkhorn Slough Photos. 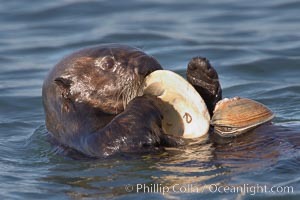 A sea otter eats a clam that it has taken from the shallow sandy bottom of Elkhorn Slough. 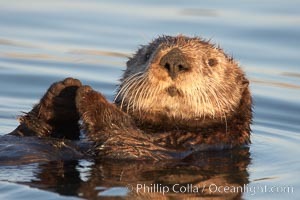 Because sea otters have such a high metabolic rate, they eat up to 30% of their body weight each day in the form of clams, mussels, urchins, crabs and abalone. 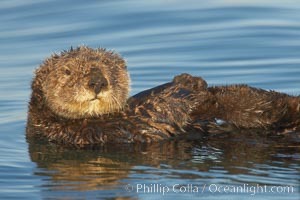 Sea otters are the only known tool-using marine mammal, using a stone or old shell to open the shells of their prey as they float on their backs. Elkhorn Slough Image. 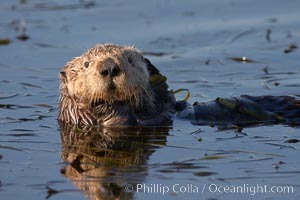 A sea otter, looking at the photographer as it forages for food in Elkhorn Slough. Pictures of Elkhorn Slough. 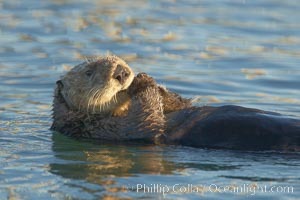 A sea otter, resting and floating on its back, in Elkhorn Slough. Elkhorn Slough Photo. 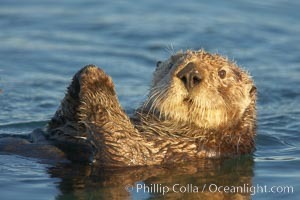 A sea otter, resting on its back, holding its paw out of the water for warmth. While the sea otter has extremely dense fur on its body, the fur is less dense on its head, arms and paws so it will hold these out of the cold water to conserve body heat. Photograph of Elkhorn Slough. 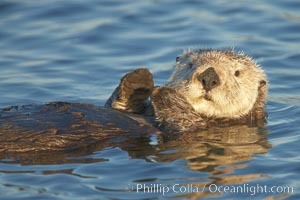 A sea otter, resting and floating on its back, in Elkhorn Slough. 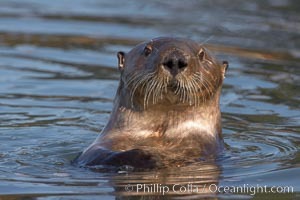 Elkhorn Slough Image. 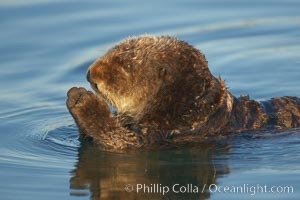 A sea otter, resting on its back, holding its paw out of the water for warmth. While the sea otter has extremely dense fur on its body, the fur is less dense on its head, arms and paws so it will hold these out of the cold water to conserve body heat. Professional stock photos of Elkhorn Slough. 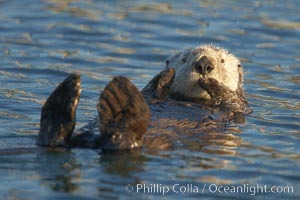 A sea otter, resting and floating on its back, in Elkhorn Slough. Elkhorn Slough Picture. 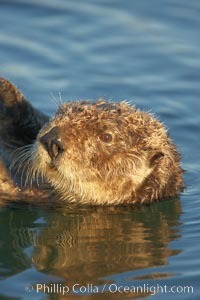 Sea otter, swimming at the ocean surface. Photograph of Elkhorn Slough.